Hip-Hop has always been and always will be revolution music. It has given those people with something to say, a vehicle through which to say it to the world. The struggle that Palestine has suffered through during the last half century is so apparent that it is a wonder that such a degree of injustice is still going on. Through their music DAM is helping to communicate to the world, the harsh reality of the Palestinian people. 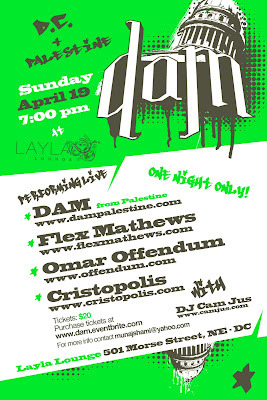 Tomorrow, April 19, 2009 they will be in Washington, DC performing for one night only. Don't miss your chance to hear their message.